Chrome 72, which is available now from the Chrome menu via Chrome, About Google Chrome (will auto update when accessed) fixes 58 CVE flaws (Common Vulnerabilities and Exposures, a catalog of known security threats sponsored by the U.S. Department of Homeland Security), 17 of which are rated ‘high severity’ and 1 of which is rated as ‘critical’. Firefox 65, which is available now from the FireFox menu via Firefox, About Firefox fixes 7 CVEs, 2 of which are marked as ‘high severity’ and 3 of which are marked as critical. Please be reminded that your tablets and smartphones have a variety of options for updating apps. The following are directions for enabling the auto update of apps on iOS and Android devices. On your iOS handheld devices, applications may be updated via Settings, iTunes & App Store and toggling the switch to the right of “Updates” to the ‘on’ position. Once your device is connected to a charger, available updates will install. over WiFi only to only update when connected to WiFi. It is recommended that you update Chrome and Firefox on all devices asap. For more information, please see the following article: Update Now! Chrome and Firefox patch Security Flaws. 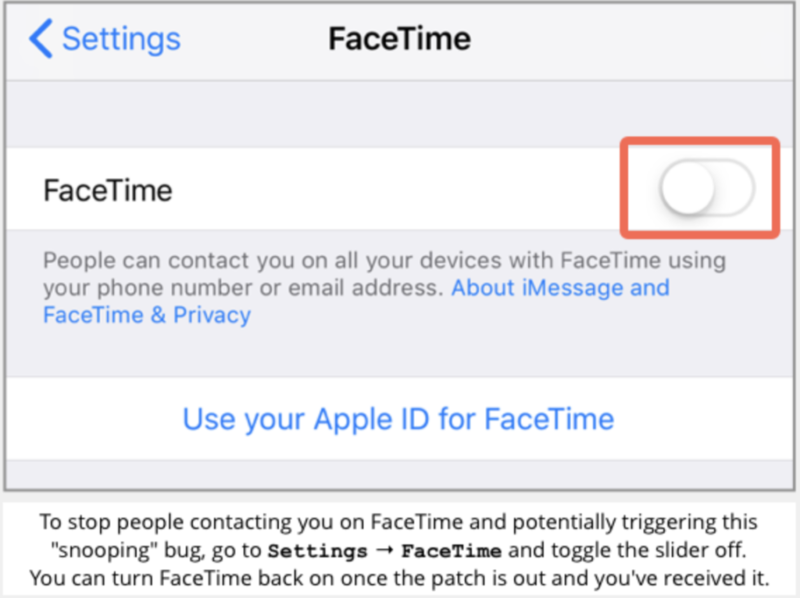 Please be advised that a snooping bug has been found in Apple’s FaceTime App. The bug exists in the apps Group Facetime feature and is triggered when someone makes a call using FaceTime and uses the “Add Person” option when the dialed number begins to ring to add themselves. Once the caller adds him/herself, a group FaceTime call will begin with audio feed from the phone of the person being called, even if the call has not been answered. Further, if the person being called hits the Power button when picking up their phone, video feed (accompanying the audio feed) gets sent to the caller. Apple has disabled the Group FaceTime feature and stated that they will issue an update later this week. You may want to disable the FaceTime app until a patch/update becomes available and you have performed the update. Data Privacy Day (“DPD”) is held annually on January 28th and is an international effort to create awareness around the importance of respecting privacy, safeguarding data and enabling trust. This year, DPD will spotlight the value of information. If you are seeking to better manage your privacy and how your data is collected and shared, you may be interested in the DPD 2019 event livestream. Please visit the following StaySafeOnline web page powered by NSCA (National Cyber Security Alliance), https://staysafeonline.org/dpd19-live/ for more information. A small amount of money for fees in connection with transferring ownership of the supposed fund. Your bank account number, SSN, birth date or other sensitive information to accomplish the transfer. Please note that some scammers may even set up a fake online bank website that supposedly reflects the funds to be transferred to the recipient. Aside from stealing fees associated with the supposed fund transfer, any personal information shared is used to further exploit the victim. Examples include, identity theft and draining the recipient’s bank account. Other variations of the Nigerian Prince scam include an email stating that the recipient is the named beneficiary in a will of an estate totaling one million or more. Personal information is then sought to confirm the recipient’s identity and transfer funds. Additionally, scammers may represent themselves as foreign government officials who are seeking to place large sums of money in overseas bank accounts or may be they may be seeking funds to fight a specific group or dictatorship. Your personal information has value, protect it. Cashiers checks and money orders can be fraudulent. Consult with your financial institution about the time it will take for a check/funds to clear and wait for funds to clear. The US-CERT (United States Computer Emergency Readiness Team) has issued an advisory respecting two vulnerabilities found in Microsoft Windows and Windows Server. Successful exploitation of either vulnerability could allow a remote actor to take control of an affected system. Microsoft has patched both of these vulnerabilities via the January Patch Tuesday update and it is recommended that users/admins apply the most recent update asap. CVE-2018-8611 is a Windows Kernel Elevation of Privilege Vulnerability impacting supported Windows client and server versions. CVE-2018-8626 is a Windows DNS Server Heap Overflow Vulnerability affecting Windows servers configured as DNS servers. 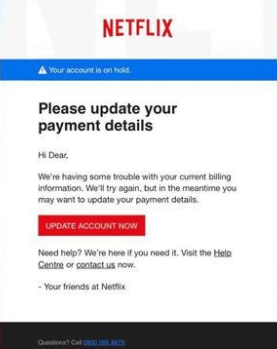 Please be advised of a Netflix phishing scam warning that “Your account is on hold” and asking you to update your payment information via an embedded “Update Account Now” link. 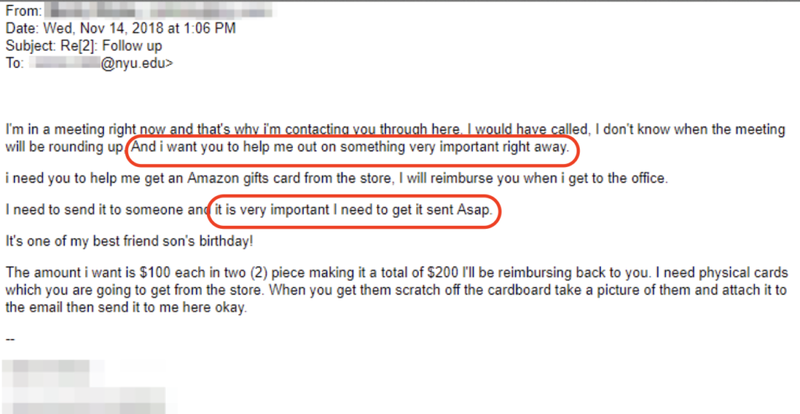 The following is a sample of this phishing message. that an email from a familiar company requesting credential input or an update of payment/account information via an embedded link is a common scam tactic designed to steal your sensitive information. to be suspicious of unexpected links and attachments in email, text messages and social media messaging. Always be sure that you are visiting a legitimate (vs. spoofed) website by typing a site URL directly into your browser’s address bar. to scan messages for expected tone/language and grammar usage. For example, the message above employs a salutation of “Hi Dear”, which is not a salutation Netflix would use and suggests that if you need help, you should visit the Help Centre (vs. Center). that @nyu.edu email accounts are protected by URL Defense, which automatically rewrites URLS in all incoming external email message and protects you at the time you click a link by blocking malicious sites. Please see URL Defense FAQs for more information. contact the financial institution associated with the payment information you entered as this information has been compromised. change your Netflix password. If you use the same password on other accounts (not a recommended practice) change these passwords as well. report it to: phishing@netflix.com and the FTC at spam@uce.gov.